DROP FLOOR FOR EASY UNBLOCKING: The Kubota drop floor enables the operator to clear blockages easily from the tractor cab without any crop loss. Drop the floor and free the rotor blockage, engage the PTO to feed the blockage through and close the floor to continue baling. This standard feature reduces downtime and helps increase productivity. INTELLIGENT DENSITY 3D: The Intelligent Density 3D bale chamber offers a combination of 3 rollers and 5 endless belts, giving it the ability to set the density of the bale in three different zones. The two aggressive front rollers that come in contact with the crop are constantly cleaned by scrapers and are designed to perform well in wet silage. They ensure instant and efficient bale start with immediate bale formation in all crop conditions. 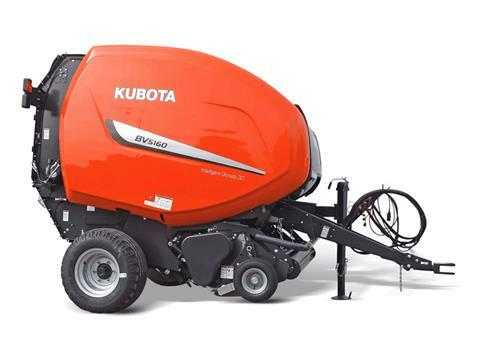 HIGH PERFORMANCE PICK-UP AND INTAKE: On Kubota's BV5160, the load on the tine bars is minimized by using two intermediate supports and two separate cam tracks located at either end of the pick-up. Slip clutch protection comes standard. A roller wind guard is fitted on rotor intake models which pre-compresses the crop, further boosting intake performance. The working width on the BV5160 is 86 in. Diameter - 24 in. (610 mm) min. - 65 in. (1,651 mm) max.